The Caterpillars of this species are have a pale brown head speckled with dark dots. The caterpillars have two pairs of undeveloped prolegs. The caterpillars grow to a length of about 2 cms. The adult moth has brown forewings, each with vague dark streaks in the basal half, and in the marginal half with pale veins with dark edges. 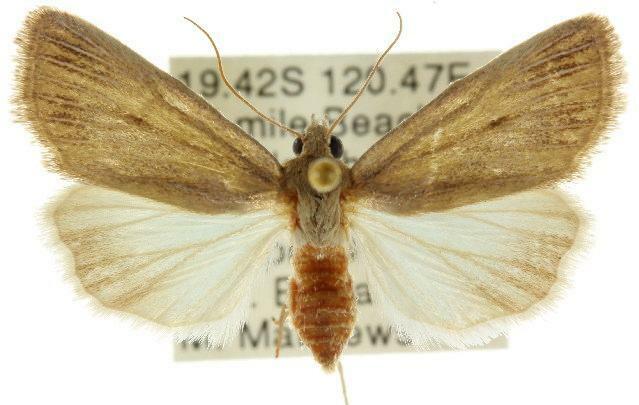 The hindwings are pale brown, fading to white at the bases, and have wavy margins. The wingspan is about 3 cms. CSIRO Publishing, Melbourne 1999, pp. 48-50, 151-152, 195-196, Plates 6, 14. 1914, p. 646, No. 10, and Plate 1, fig. 11.